The passing of one of the most significant political figures of our lives should not plunge us into a sour soup of competing grudges. But alas, welcome to 2018, where shallow immaturities can poison the occasions that should bring out our best instincts. The death of John McCain should first and foremost attract appreciation for a man who served the nation he loved with such distinction. This does not forbid frank discussion of his complex politics or the tone of his final years; but one might think those things would be subtly attached to higher reactive instincts. What we have been treated to is a barrage of juvenile hyperreactivity fueled by the blazing furnace of today’s politics. While McCain’s contemporaries from across the political spectrum offered uplifting measures of praise, the mudpits of Twitter fired up with a wide display of ugly opportunism. As far back as his 2008 nomination and his 2000 GOP primary campaign, plenty of Republicans have expressed dismay at his inconsistent conservatism. I know; I have often been one of them. But in my daily life of radio talk shows, I have often told complaining callers that this is the choice made by the only constituency with a voice in the matter: Arizona voters. Not every state elevates the staunchest conservatives. Some states have given us Republicans more liberal than Southern Democrats used to be. Most Republicans were satisfied to unite behind McCain as we all tried to prevent the Obama presidency in 2008. The ensuing years contained chapters of the Senator fighting for some conservative goals and thwarting others. Reactions followed accordingly; he was far from the only Republican offering a mixed bag of political instincts. But the ascendancy of Trump changed America, and it changed McCain. His famous graciousness ran empty for the man who plowed through the opposition to show voters a new energy and bolder focus toward goals Republicans had craved for decades. In the opening months of the Trump presidency, McCain made clear his contempt for the man, distaste so broad and engulfing that it included the millions who had elected him. This is no small slight, and that is why it is not wrong to include observations about it in remembrances of him. But spurred by the adolescence and anonymity evident in countless social media accounts, what gathered was a wave of smears that rose to a level of viciousness that was disillusioning even by today’s standards. As unfortunate as it is for ugly people to say ugly things, there was additional dispiriting news to be found in the reaction to McCain’s passing, and it actually came from among those praising him. 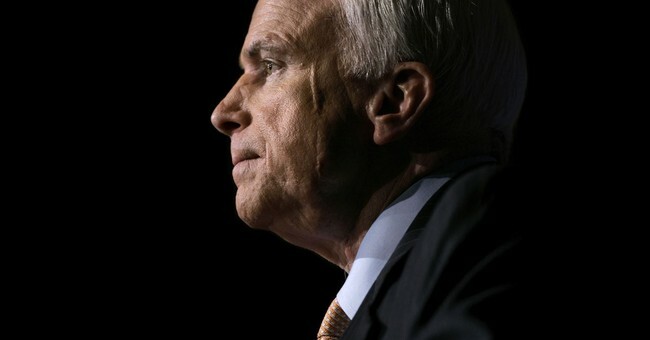 While the vast majority of accolades carried proper tones and motivations, it became clear that some tributes were magnified, if not wholly inspired, by McCain’s most familiar habit of his last two years— trashing Trump. McCain was always one of the left’s favorite Republicans, for the plain reason that he shared some of their views. Unwilling to back tough immigration laws and the repeal of Obamacare, he always enjoyed moments of praise from Democrats. Throw in his anti-Trump vitriol, and he became a handy hero to Democrats wishing to appear bipartisan by finding a Republican they did not despise. But some of the loudest hurrahs came from Republicans who shared his loathing of Trump. In the Never Trump tree house, his heroism as a patriot, veteran and POW was matched if not surpassed by his willingness to give Trump hell. In these days that should be filled with unifying appreciation of an American original, we get playground hoots of joy that Barack Obama will be at the funeral while Donald Trump will not. A word about funerals: there was a reason President Trump did not attend the services for Barbara Bush: she hated his guts. At the McCain funeral, the eulogies to be offered by Obama, his rival in 2008, and George W. Bush, his primary rival in 2000, will be filled with meaning and sincere emotion. They will also reveal the fact that McCain got over those losses far more easily than the 2016 Trump win. This was catnip for Trump-hating Republicans who now lament that we have lost a “truth-teller.” What they will miss most is the reputational cover he gave to the various loudmouths and backbenchers taking potshots at the President and offering his agreement as validation. This is all just sad. This period of remembrance should be about the whole man and his whole life, a unique story just short of 82 years, filled with examples of devotion to duty, honor, country and family. While the coda of his composition was filled with passages that ignite our national passions of the moment, the days to come should be filled with reminders of larger concepts: his service, sacrifice and courage.